I figured might be a good idea to try to explain the update to stat loss. First of all it was flat out broke before and once I fixed the broke part the math was still broke. Previous system as it was coding called for a 25% chance of 5% stat loss on each death. I lowered the chance for stat loss to 15% and enforced the change on all pets. I do not like changing things that already existed in game but 25% is just way to high. I might go even lower or I might go for something random, not sure until after I see how 15% works. Also increased the amount of restore potions that can be used, previously the system had 125 and no complaints (duh.. no stat loss). This number has been increased to 350+ on all new pets and I will probably go retro on this as well, just give me a moment since doing this causes a 5 minute lag. Fear not though, as with any system I will see a chance to have fun with it. This was no different. Hopefully the above explains a lot and if you have any questions feel free to ask. 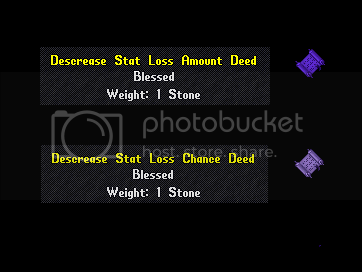 Also below are a few screen shots from the new additions that effect stat loss and your pets. These 2 new traits are available in game when breeding. The scuttlebutt about on the new Stat Loss System for pets has been fairly one sided, and as I think you can guess, it's been negative. The primary complaint being it effecting Donation pets. I can understand the frustration here, but to add salt to the wound, the stat of Base Damage can not be repaired. Look, I don't have a dog in this fight. I don't even use pets (much), but I agree with the complaints. It's one thing to adopt the system, and that's fine, but to make some of the negative effects totally irreversible, that's another. You know how these pet slinging, bank sitting, tamer folk can be, many speak with their wallets (no offence to the tamers out there, you guys are awesome). Orb & I had a heated discussion concerning Donation pets vs Player developed one. Both Cost something, so are equal in value. But if one is given any advantage over the other, why have both systems in play? Because We couldnt come to an agreement, I cant speak one way or the other, I can only mention the points that lend weight to this subject. But one DOES have an advantage over the other. My bred Ancient Fire Steeds will never have the raw damage output of my Royal Steeds. I've not run into another critter that matches the Evo Dragon in utility (sure, Cu are great and all...but they are not immune to poison, nor hit for high 200's-300). You could argue that these can be obtained in game, sure. But that brings me to the special moves of the donation only pets, and their base damage, unless I need to be corrected, nothing tamed comes close for utility and damage slot for slot. The stat loss system really doesn't bother me. I only use pets when I'm pushing the luck suit on specific t-maps, and they RARELY, if ever die (freaking Minotaur). What does put a little curdle in my girdle though, is the inability to remove base damage loss when it is hit by stat loss. To be able to repair the damage to things like min and max damage perhaps Cain could create more recipes for the Advanced Vetinary Tool Kits? This would remedy the problem with pet stat loss to those stats. The special moves of Donation pets is what makes them desirable. But..ugh...I think both donation & Player developed should have the chance for stat loss. There, I said it. Orb will kill me for saying so. Heres my arguement: Players can keep their pets almost 100% safe even while playing, just learn your limits with them. Dont just helter skelter "all kill" everything you see. There is an art to having a pet, keeping it "healthy" & learning how to be a "Real Animal Handler". The only time one risks a pet, is via conn loss. But if Im not mistaken, they auto stable/log with you when you fall off the server, dont they? There are also pet protection potions ingame to help protect pets from stat, for those times when you plan on doing something stupid(Thank you for these Kane!). C'mon, seriously, why does everything have to have 'baby-guards' on it, what ever happened to simple common sense? Stat loss does feel a little rough at the moment. After only two instances of stat loss on my Royal it has lost almost half of its base damage which is a little worrying, at least until the stat loss protection potions are a little more readily available, and / or base damage can be repaired. -- Only assuming that you know whether a mob has anti pet code beforehand, that the monster did not attack your pets first, that you yourself did not die, they are not poisoned, disobey an order, etc. -- This feature is not on this shard and they are quite capable of dying while you are disconnected. == To my knowledge the recipe was only available during a couple auctions. Not counting how expensive a suit / crafting potions may be, on top of the recipe price itself. ==Perhaps not a 'baby-guard', but something flexible enough to allow reasonable experimentation and test new things without feeling so much worse for doing so. Im a bit confused. Players keep talking about stat hitting damages. Normal Stat loss on a player usually(use to) only hit Str, Dex, Int & skills. Are you saying that stat loss is hitting areas outside of this norm on pets? If so, perhaps these are bugs, because those arent anything we can fix, by normal player means. I cant see Kane implementing something intentionally, without a means to repair it as well. ---The trick to this is to always use a trial/junk pet, to test the mob, not send in your best to die. ---Mmm, Well, part of it seems to be working (I have it happen frequently here). Perhaps the other part is a bug that needs looked at? --I have found the potions on several vendors, going for 30k per. Im sure players just dont realize they are available ingame. --I repeat: Junk/Trial Pet, before you use your good one. That is correct Sage, Stat Loss can, and WILL affect the pet's base damage. This is (at this time) impossible to reverse, rendering your beloved pet near useless if it happens frequently. Like I mentioned, I have no problem with the loss occurring when the stats can be replaced with in-game methods. But when that is impossible, it seems pretty crappy, and will encourage players to NOT use pets. If you don't use them, why buy them? See my point? I think most people are in agreement that the stat loss change has been fairly rough. We aren't used to it, there aren't enough oints on the market at the moment to help with it, there are only one or two of the "Dr.Doolittle" recipes in game from auctions, etc, etc, etc. Things like loss to base dmg is quite possibly the worst thing that could happen to a pet. I am of the opinion that most people are somewhat ok with a stat loss system, but being unable, or capped, on repairing a pet is not ok. I am really hoping that Kane finds it in his heart to give a solution for this as we are all kind of handcuffed at this moment with not wanting to lose irreparable stats on pets we spent tons of time, or money on. I'll say that I am not opposed to the idea of stat loss, I just don't think that it's particularly practical to be using useful pets considering how inaccessible and limited the options to reverse / prevent it is at this time (recipes, resources, etc.). I don't understand the reasoning behind this permanent loss--what if this was applied to us people-types too?--there would be a lot of screaming and kicking and spitting and crying and gnashing of teeth, (kind of the reaction I'm having right now thinking this could happen to my beloved pets). I am and have always been a lousy fighter...my pets protect me while I'm gathering resources for crafts which is my play style--it's the way i enjoy the game. Unfortunately, because I travel all over Tram and the other "safe" areas, (no Fel), I do rarely run into very tough custom creatures I didn't know were in that area resulting in pet deaths. This happens when I'm in a new area or a new quest opens up and we have to "discover" where the spawn is, (such as the dragons/greater dragons that now spawn near Shame, part of the egg gathering quest). My AFS died when we ran into a mob of them down a path near Shame I had traveled daily with...up until then...zero spawn about. Fortunately, this death happened before this new perm loss so my pet didn't lose anything I couldn't repair. And another time I entered a cave to do some mining only to find someone had released two!! manticores in it...ACK!!! I had NO clue what a manticore was until then. I've put a lot of work, time and money into my pets, as do all pet users, and I think that pets should have the same ability to be fully repaired when damaged that we two-feeters enjoy. Peace. Taking a permanent stat loss seems cruel. Maybe have the pet loose levels and loose that amount of points. At least then you could train the pet back up and regain the points lost. It is still punishment for letting the pet die as you will not have to regain those levels back and spend the points to get it back to max level. Maybe a random 1-5 levels loss. Not loosing the Levels applied to the pet but just reduce the levels on death. Just an idea not sure if it is feasible. Next time you take the car out, you are much more careful with your vehicle, you read the owners manual, you drive the speed limit, you don't drive in dangerous conditions etc. Pets are not the solution to every encounter, you need strategy, groups, skills, spells etc and if pets were invincible the game would get boring without the risk of loss. And i've a counter exemple. Broke yourself a leg ok, your body will fix you bones right ? but did you knew that your bones will be harder after than before ? Look at the sin dungeon, we can't use pet, it's great and hard, you have to be careful at every moment to survive. You did a great job with it (except for teleporter timer... it's just not funny to wait) So why are you complaining, this is the perfect example of the diversity of the shard and the use of different strategies to defeat monsters? As far as luxury cars go, when you hit a wall with them, you might just buy a new car, because repairing it will cost more money. Just take care of your pet and all follow me + leash them when in trouble. Risk Versus Reward comes to mind here. I'm going to leave it at that... Red text has my vote. P.S. as soon as you buy a car its value goes way down... Would you want you pets to be like that??? 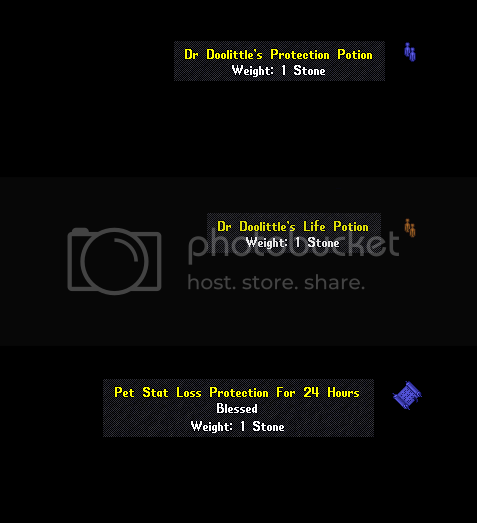 We had a few protection deeds giving 24 hours protection for pets on the auctions a few times, at least I got 2. And there are so many players selling the protection potions on their vendor, which can craft you as much as you want if you contact them. Try to reach Shena, Senticore, Krynn..